Recently completed rancher in Sunrise Cove, with the increasingly popular split bedroom design. Step into a large tiled front entry that leads to bright living area with vaulted ceiling. The living area is open to the kitchen/dining with modern white cabinetry, tiled back splash and island with seating. There are two good sized bedrooms and the main bath on one side of the home, with the huge master suite with walk-in closet, en-suite bath with one piece tub/shower and double vanity on the opposite end. This home is efficiently heated with a main floor living area heat pump and convect electric baseboard heating throughout the main floor. 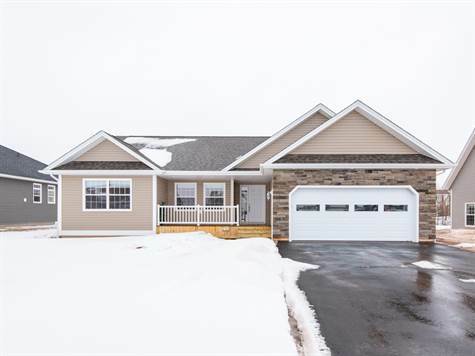 There is a two car garage, main floor laundry, covered front verandah, rear deck and a full basement perfect for storage and future development with three egress windows. 7 year Lux home warranty. Make the call today to arrange a viewing before it’s gone!